Background: In fiscal year (FY) 2012 there were 2 groups of 100 or more people who arrived @ America's southwest border seeking asylum. In FY 2018 there were 12 such groups & so far in the first five months of FY 2019 there have been 70 – these groups have come to be known as caravans of migrant families (adults & children) with as many as 12,000 people mostly from the Northern Triangle countries of Central America – Guatemala, Honduras, & El Salvador. Source Graham Ledger. Migrant families no longer try to evade Border Patrol agents after illegally crossing the border but rather have learned that if they turn themselves in after placing one foot on American soil & saying the word "asylum" they will be released into the U.S. in accordance with our asylum laws as they await a hearing in federal immigration court – current hearing backlog: more than 829,000 cases meaning a ruling can take years to be made. As many as 94.1% of the migrants pretending to seek asylum know they don't qualify for asylum & their claims will be refused – see previous posts dated February 10 & 28 for details. Arrests of Central American families illegally entering America in the first five months of FY 2019 hit a record (136,150 people) exceeding the total number for all of FY 2018 (107,212 people). And the flow of migrant families seeking to abuse our asylum laws is growing thereby overwhelming government facilities intended to hold single adults for a few hours @ a time. In addition, the number of unaccompanied children caught @ the border so far this FY is 26,937 compared to 17,501 for the same period in FY 2018 – talk about separation of children from families. Overall the Border Patrol has made 268,044 arrests from October through February compared to 136,209 for the same period in FY 2018. U.S. Customs & Border Protection (USCBP) reports that 66,450 aliens were arrested as they tried to illegally enter the U.S. in February – the highest February total since 2008 & the highest monthly total since 2009. In addition there were over 10,000 people deemed inadmissible @ ports of entry thereby bringing the total arrested or deemed inadmissible to more than 76,400 people in February. See table below. USCBP further reports that there were 40,000 family units – aliens travelling with children – who were either apprehended or turned back in February, a ten fold increase from two years ago. See graphic below. Family units & unaccompanied children make up 62% of those arrested or deemed inadmissible @ the southwest border up from 27% in February 2017. Families with children require special time consuming medical treatment & facilities that have been overwhelmed by fraudulent asylum seekers who are trying to game our immigration & asylum laws. The above statistics describe the destructive violation of our sovereignty that President Trump has recognized as a crisis for which he has declared a national emergency - a movement of an exponential rate of growth in an endless direction toward America that migrants, drug smugglers, & gangs from all over the world have picked up on. On December 11, 2018 President Trump met with soon-to-be House Speaker Nancy Pelosi & Senate Minority Leader Chuck Schumer in the Oval office to discuss government funding for the portion of the federal government not already funded in fiscal year 2019 & Trump's request for $5.7 billion to build a 234 miles long wall along the southwest border – the meeting was televised. 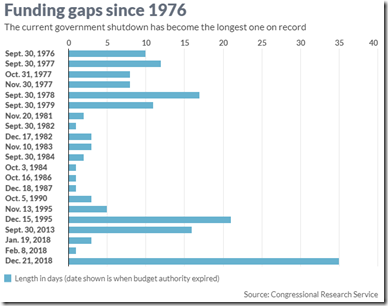 After no agreement was reached the government was partially shutdown @ 12:01 AM on December 22 in what was the longest government shutdown to date – 35 days. See graphic below. 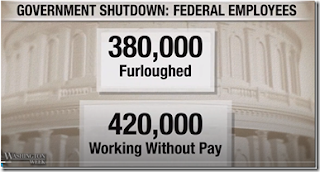 The number of federal employees affected by the partial government shutdown totaled 800,000 people broken down as shown on the following graphic. After 35 days of shutdown the President & Congress agreed to reopen the government on January 25 for three weeks to see if a deal could be reached regarding funding the border wall. After Pelosi said she would not approve more than $1 for a border wall Congress passed an 1,159 page, $328 billion spending package, including $1.4 billion to build 55 miles of barrier along the southwest border, that will keep the federal government open until October 1 – there is no reason to believe anyone read the bill that also includes $22.5 billion for other border security measures including 800 new Customs & Border Patrol officers. The bill passed the Senate 83 to 16 & a few hours later it passed the House 300 to 128. 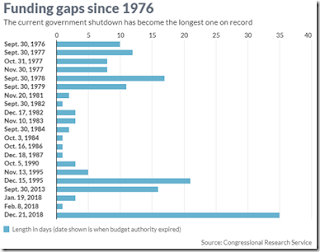 Even before he signed the bill on February 15 Trump declared a national emergency under the National Emergency Act of 1976, bypassing Congress to divert money from elsewhere in the government to build the proposed border wall – this totaled $8.1 billion. See graphic below for breakdown of these redirected funds (includes the $1.4 billion approved by Congress). On February 26 the House passed a resolution, 245 to 182 with 13 Republicans supporting the resolution, that would terminate Trump's declaration of national emergency specifically objecting to the reallocation of $3.6 billion from Department of Defense (DOD) military construction projects shown in the above graphic. 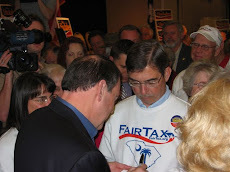 On March 14 the Senate voted to support the House resolution 59 to 41 with twelve Republican senators voting with the Democrats (Alexander – TN, Blunt – MO, Collins – ME, Lee – UT, Moran – KS, Murkowski – AK, Paul – KY, Portman – OH, Romney – UT, Rubio – FL, Toomey – PA, & Wicker – MS). On March 15 Trump vetoed the congressional resolution that disapproved the national emergency declaration. The House plans to hold a vote on March 26 to try to override the veto. It shows the priorities of Democrats & those Republicans in Congress who fight against Trump's authority to declare a national emergency wherever he sees it, an authority that Congress gave to the President via statute in order to avoid as many hard decisions for themselves as possible. Congress will fight the president on declaring a national emergency on our southwest border but will not change the immigration & asylum laws that are so obviously being abused & used as weapons against America. But Congress may only have the power to block the military construction portion, $3.6 billion, of Trump's plan to fund the border wall. Without the $3.6 billion Trump would still have $4.5 billon of the original $5.7 billion sought. Trump already has the authority to move $2.5 billion seized from drug interdiction programs operated by the DOD to projects that would interrupt drug smuggling corridors. Transferring the $2.5 billion drug interdiction money to the Army Corps of Engineers would provide the money to build barriers along the southwest border where drug smuggling occurs. The $600 million from the Treasury Forfeiture Fund represents money sized in drug arrests & banks that committed sanctions violations & other crimes. The Treasury uses this fund for "programs & activities aimed @ disrupting criminal enterprises." Trump can transfer this $600 million to build the border wall by declaring it is for law enforcement purposes. However, all of this misses the point of how to address an emergency. The border wall is certainly necessary & can't be built soon enough to suit me but it is not the answer to an emergency. The solution lies in Congress changing our immigration & asylum laws or @ least the portion of our asylum laws that are being abused thereby making fools of us. No other country would let such abuses continue. In fact European Union countries have acted to cut off immigration after what became known as the European migrant crisis in 2015 whereby, for example, Germany admitted over 1.4 million migrants. 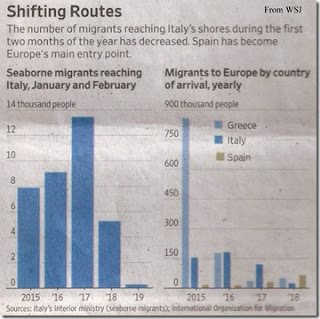 Now Italy has taken emergency steps to stem the number of seaborne migrants to just 262 the first two months of 2019 down from 5,200 during the same period last year & over 13,000 in 2017. There were 181,436 migrants that entered Italy's shores in 2016 & only 23,370 in 2018. See graphic below. Italy has proven that immigration control can be done but it takes a will as shown in the above graphic – but that will is not there in the U.S. 116th Congress – & really hasn't been in decades. And you can take me literally on that. Last week I watched former five term Colorado Congressman Tom Tancredo speak @ two town hall meetings broadcast on One America News Network – first in Cincinnati & second in Detroit - with a group of patriots dedicated to building as much of the border wall as possible with private money. Many readers will remember that Congressman Tancredo's sole issue was border protection & fighting illegal immigration. 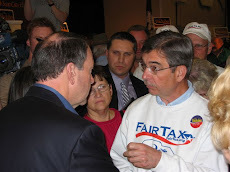 In both town hall meetings Tancredo explained that when he was in Congress he could not find one Republican let alone any Democrat who would join him in pursuing a realistic approach to border security. In fact Tancredo said he was reprimanded on several occasions by Republican leader Tom Delay for even pursuing the issue. So we are up against it as the elites of both parties shout by their actions for all of us to hear & know, but we are unable to hear refusing to listen, heed, or be persuaded, that they want illegal aliens to enter America for one reason or another. These elites are protected by armed guards & walls so that any problems or crimes resulting from illegal aliens will not apply to them or their families – just to people like the late Kate Steinle or you & me @ random. Now many of our elected representatives don't approve of the way Trump pursued the funding of the border wall – but certainly none can approve of what is actually going on @ the southwest border – click here to see 53 illegal aliens rush to America after cutting the fence in the Pacific Ocean & then only when caught claim asylum & here to see ten illegal aliens sneak across the southwest border in San Diego after smuggler uses young girls as decoys. The people in these videos are not asylum seekers – they are fraudulent opportunists who are entering America uninvited ahead of people who have legally applied for citizenship & also ahead of people who have legally applied for refugee status or asylum. You can side with the Democrats & the dozen Republicans in the Senate who voted against Trump's emergency declaration or with the Republicans who supported President Trump in looking for a way to protect America from an illegal immigration onslaught that shows no sign of abating & has been in the process of ruining America for decades. But we should clearly recognize what is happening to our country regardless of whether or not Trump is constitutionally correct in declaring a national emergency or politically incorrect in so doing. The number of illegal aliens entering America dropped in 2017 to new lows after it was perceived that Trump, in his first year in office, would clamp down on illegal immigration – similar to the results in Italy today as shown above. It was only after the migrants learned they could reach their goal of entering America through the abuse of our asylum laws that the illegal immigration onslaught regained momentum. It is clear that a few changes to the immigration & asylum laws would drastically change the destructive actions @ our southwest border thereby eliminating the emergency. This could happen in the next five minutes if Congress wanted it to. But since it doesn't happen we know that our elected representatives in power don't want it to. What a disgrace! I'm also disappointed in all of the Republicans who sided with the Dems and surprised at 2 of them. Conclusion is Spot on. This is where we come in. We must confront Congress and look to support more responsible representatives and senators in primaries. Amazing how oblivious the GOP really are. Illegals increase pool of voter fraud for Dems. Mere mention of voter fraud and Dems become apoplectic. Amazing also is how short sighted both parties are in the significant increases to US debt illegals add. Left unchecked, our foreign creditors are more likely to demand higher interest rates for our debt or simply dump their US debt holdings. Level of economics expertise and understanding of global finance fundamentals by both parties are astoundingly weak.